How Much Does the 2016 Dodge Grand Caravan Cost? How Many MPG Does the 2016 Dodge Grand Caravan Get? What’s New for the 2016 Dodge Grand Caravan? This classic minivan is known to offer an incredible low price, and fantastic standard amenities. For 2016 the Grand Caravan continues to be an excellent choice for families and anybody who needs extra interior comfort and cargo hauling capability from their vehicle. New features for 2016 are quite modest, with the Grand Caravan coming back mostly unchanged from the 2015 model year. However, customers can expect to find some equipment shuffling, which means even more standard amenities in each trim and a great overall value. Each variation of the 2016 Grand Caravan will be powered by the excellent 3.6-liter V6 engine. It is paired to a six-speed automatic transmission, as well as a capable and responsive front-wheel drive system. The minivan will deliver an impressive amount of power to make it a comfortable option for highway, city, and country commutes. Altogether, the drive system of the Grand Caravan will offer 260 lb-ft of torque and 283 horsepower. Customers will find that their Grand Caravan can offer a zero to 60 mph time of just 8 seconds, which is impressive within the segment. Also great is the fuel economy, with the family hauler delivering up to 17 mpg in the city and 25 mpg on the highway, for a combined fuel economy of 20 mpg. Dodge will make it easy for every family to create their perfectly equipped minivan. Not only does the minivan come with impressive standard features, but the brand offers six different trim levels, a number of packages, and a great range of standalone features. Every configuration of the Dodge Grand Caravan has been stocked full of amazing features, and even choosing the AVP (American Value Package) will offer exterior highlights like 17-inch steel wheels and heated mirrors, as well as comfort features like dual-zone air-conditioning, and a convenient second-row that can be folded, reclined, or completely removed to cater to your needs. Customers can also equip Stow ‘n Go seating for the second row. For entertainment the Grand Caravan will feature a four-speaker audio system, as well as an auxiliary audio jack and CD player. Available features can include the excellent Uconnect infotainment system, second-row captain’s chairs, and a rear entertainment system. Also available on many trims is a Blacktop appearance package which equips eye-catching features like a black grille and silver interior accents. On the forefront of the mind of many minivan drivers is the safety of their passengers and precious cargo. The Grand Caravan delivers security and peace of mind with ease, as each Dodge minivan will feature stability control, active front head restrains, and antilock disc brakes. Driver assistance features like cross-traffic and rear sensors are also available. 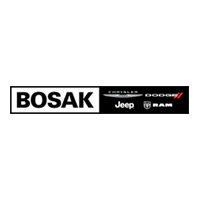 To learn more, or to schedule a test drive in this fantastic minivan, contact us today at Bosak Motors. We would be happy to answer any of your questions about this celebrated 2016 Dodge Grand Caravan minivan!